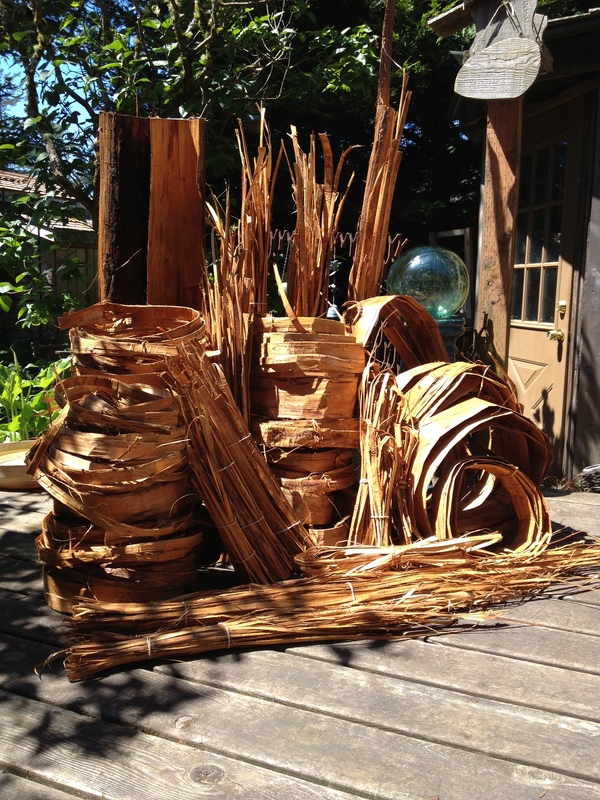 Long before the actual weaving process, I spend time throughout the year collecting, cleaning, sorting, drying, and storing the numerous plant fibers and natural materials used in my basketry. From Spring through October I keep busy building up my supply of materials. From my home landscape I harvest akibia and wisteria vines, New Zealand flax and dracenae leaves, and neighbors have helped by dropping off pruned Manzanita branches. When the winds are westerly, a walk on Manzanita Beach can result in a batch of bull kelp or an interesting piece of driftwood that can be incorporated into my designs. Nearby Nehalem Bay at low tide also offers up spruce or cedar roots that have made it down stream at the end of trees that have been torn loose by some heavy flooding. Having traveled south and east in Oregon, I have collected western red cedar bark, wild cherry bark, and bear grass in the Cascade Mountains’ foothills; willow, cattail, and tule along the Blitzen River; and Ponderosa pine needles near Bend. Much of what I collect requires a cleansing wash to remove dirt and critters, a wipe-down and drying out period (in or out of sunlight), sort and bundle or coil into manageable bundles, and store until needed. When ready to weave, the plant fibers need to become pliable again by soaking or moistening, the difference being in the density of the fiber. When designing baskets and other organic forms, my most creative are those whose designs challenge construction limits of the materials. I consider this when selecting materials to use. My most favored of weaving materials and a valuable resource to the Northwest Indians, Western Red Cedar was preeminent among the flora of this region for its variety of cultural uses. The tree is actually a species Cypress (Arbor Vitae) and its Latin name means “tree of life”. It seems an appropriate title for its significance in the lives of the people. For its use in basketry, the most valuable part is the fibrous inner layer. I follow a traditional method of “pulling” bark strips, harvesting in the spring when the sap flows. Strips up to twenty-five feet long can be broken or jerked off when they reach up towards the crown. The brittle outer bark is pulled or scraped off and the strips are further narrowed and the layers separated. The inner portion is light in color with a smooth leather-like texture. It will turn from orange to light brown as it ages for a year before it can be used for weaving. At that time, the bark strips will be moistened and cut into the final measurements for the basket form. I have coiled, plaited, twined, folded and stitched many baskets. These techniques have allowed weaving to remain a dynamic medium for new weavers as they explore man-made fibers and elements. Resources abound for those wanting to learn more about basketry.